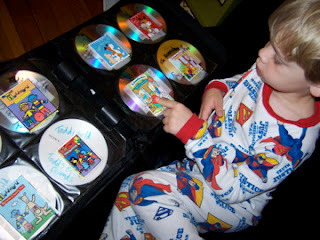 One of the biggest space hogs are all of those DVD cases and if you have kids...oh my word, forget it! Well after the millionth time of going through the DVD cases to make sure the Toy Story DVD was actually in the Toy Story case I came up with a new plan. I bought one of those big CD books and put all of the DVDs in that. We make a copy of every DVD so that the 4 year old and 2 year old don't ruin the original. The problem is that there are no pictures on the copied DVDs and they can't read. So I went online and got the images of every DVD and printed them out on card stock. I cut them out and originally I laminated them but then felt that was too time consuming and expensive so I then opted for clear packing tape and covered the picture with that. Why even laminate you ask? We are talking about 2 kids under the age of 5. They have this condition called "peanut butter and jelly fingers"...it's not serious, just sticky. And now the beauty of all of this is that both of my kids can pick out what DVD they want to watch and it takes about a third of the space than the original cases. Now you don't have to be under 5 to enjoy this. We converted all of our DVDs to books also. And at first I thought, well we can read I don't need to do the whole picture thing but as many adults in the Gen X generation I am a visual person and if the original DVD doesn't have a picture on it and just the title of the movie I find myself wondering "have I seen this?, "who is Tim Roth anyway?" So do yourself a favor...buy a Cd book and get rid of all of those cases once and for all. Many of them can be thrown in your recycle bin or else put them on freecycle. You never know what might be treasure to one and trash to another. What an awesome idea! I know we could definitely use this at our house, thank you!